Welcome to our special crew of film fans! Thanks for joining us. The common bond of HOME PROJECTIONISTS is our passion for great movies, whether we’re discovering new ones or rediscovering old favorites. We’re happy being the program directors in our own homes or wherever we may be: watching in a home theater, on a big screen, or a Mac, PC, or iPad. We may imagine the ideal movie theater experience—think Manhattan’s Angelika, Austin’s Alamo, Chicago’s Music Box, or L.A’s Egyptian—where the draping curtains add an air of mystery, when overwhelming commercials don’t bombard the senses (and overwhelming prices don’t ding the budget), when the audience isn’t distracted and disengaged. For us, it’s more than just watching a movie. 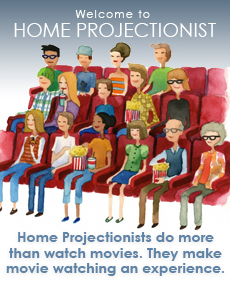 It’s about creating a shared experience with our friends, family, and members of our own HOME PROJECTIONIST circles. What are we watching next? Let’s connect here and on Facebook!